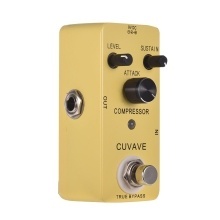 Classic compress pedal with smooth and tight attack and decay, preserves the original signal transients perfectly. 3 knobs control: LEVEL/SUSTAIN/ATTACK, suitable to play in high gain and distortion or tight clean sound. True bypass footswitch for switching between compress and bypass status.